Enterprise resource planning (ERP) software is now a standard software-as-a-service offering in the cloud. ERP applications help businesses of all sizes and in all industries conduct business planning and management. This software runs core business functions but also lets you extrapolate data from these processes and analyze them in order to improve your business. This article looks more closely at ERP software and how accounting firms can leverage these applications to diversify their business models. The ERP market is exploding and changing from on-premise installed software to cloud subscription services. Allied Market Research is anticipating global sales of ERP software products will reach $41.69 billion by 2020. This unparalleled growth has come because these tools allow for the more efficient function of businesses. For accounting firms, ERP software helps them manage the ever-changing auditing and regulatory environment, along with financial reporting, banking, inventory, and reconciliation processes that are standard parts of their business. All of these ERP platforms ranked highly as cloud solutions for small businesses – including accounting firms. Get a free assessment of your readiness to adopt cloud solutions. Instead of having silos of data, and multiple platforms where information would be repeatedly typed, ERP platforms take data and layer it across the modules within the platform. The time saved by entering information just once is a primary characteristic of ERP software. Automated Process Management that includes financial reporting and bank reconciliation, investments, and auditing compliance. You can even automate the ERP software to handle payroll. These are all tedious manual tasks that automation can streamline. Data Analysis and Reporting features are particularly robust on these platforms. You can capture and analyze huge amounts of data and report on them using data visualization tools that make the reports very user-friendly. 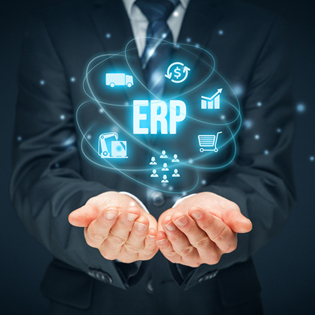 The best function of ERP, most believe is the software’s ability to breakdown financial and sales data in ways that provide actionable insight. System Interoperability is a feature of cloud software, and these ERP platforms hold true to the model. You can integrate with your existing infrastructures, and then automate some of your more manual processes. You can set up dashboards where employees or clients can access the information that is most important to them. A characteristic of all ERP software is that they provide you with the data you need when you need it most. Financial Management is of course hugely important to the small business, and ERP platforms take financial reporting and management and make these tasks easier to accomplish. Some of the basic functions include dividends management, trust fund management, trend reporting, expenses, profit and loss, and much more. Customer Relationship Management is a vitally important module in the ERP tool kit. You can use it to service existing clients, for call center management, tracking sales, and much more. Are you starting to understand why ERPs are the top choice for cloud solutions for small business? Now let’s look at how you can use ERP platforms to help improve your business. Today, accountants must be able to add value for their business clients. The industry is too competitive today not to expand from traditional accounting practice. With competitors ranging from larger CPA firms to do-it-yourself software and apps, to artificial intelligence platforms like IBM Watson, tomorrow’s accountant faces unprecedented challenges that simply didn’t exist a decade ago. The numerous changes in technology and business bring many challenges to all professionals. Those challenges also rest on accountants’ shoulders. They present tremendous areas of opportunity where accountants can grow. They must find a way to alleviate the burdens by learning how to use technological tools and how to apply them. ERP software is exceptionally complicated, with layered features. Large scale ERP software can take months to learn properly. If you are considering ERP as a cloud solution for small business, or even for your enterprise, it might make sense to reach out to a managed service provider to assist in training your team to properly use the software. A managed service provider can assist in the process engineering necessary to fully leverage ERP in your accounting practice, as well as with clients. Developing a technology offering as part of your practice is an important way to stay competitive in an ever-evolving marketplace. A managed service provider can help you implement ERP and change your business to fully leverage it. To learn more about managed services download the white paper: Managed IT Services For Small Businesses. Are you ready to take your accounting firm into the future? Request a quote on TOSS C3 managed services today.